I show you how to draw a cow – in few simple and easy to follow steps. Did you know that there are about 800 breeds of cows? It seems that official name for cow is “Cattle” but let's call this cute animal just "Cow". I’ve chosen Holstein cow because it is relatively easy to draw. Besides, black and white colors are quite distinct, so when you use color pencils you don’t need to make any difficult shading etc. Another remarkable fact about cows is that they have 360° panorama vision. 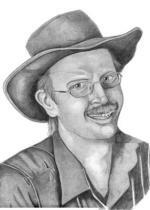 This extraordinary vision helps them to spot predators coming from all directions. Contrary to popular belief, cow does not have 4 stomachs; they have 4 digestive compartments. The first step is– as usual –enlarge the picture and observe every detail on it. It is OK if you are not able to make this drawing on the first try. RE-draw it as many times as necessary. I know it is sometimes frustrating but almost every artist feels the same feelings when they are learning. First, sketch a bended rectangle. This rectangle will be the cow’s body. 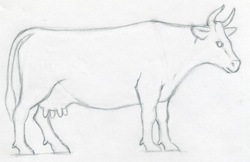 On the right side outline the silhouette of cow’s neck. If possible, sketch these two body parts in the same or similar size ratio as you see on this picture. Make the pencil strokes loosely; enlarge the picture to see the details. 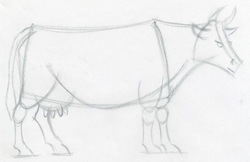 Outline the cow’s head and draw the belly curve, as you see on this sketch. The shape of the cow slowly develops and every step also becomes easier as you progress. This step may be a little tricky because you are about to draw cow’s legs. Please outline the legs as you see on the picture. Smaller ellipses on legs are the knees. 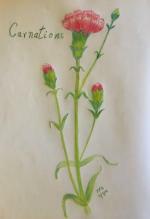 Be extra careful about the size of these sketches because they will determine the total balance of the drawing. This is the part that may be a little complicated for the beginners, but it’s OK if you cannot make it right on the first try. Making mistakes is perfectly normal so be easy about it. Draw and RE-draw. If you are upset, then leave the pen and paper and do something else. Come back later and continue drawing. Everyone has these occasional mental black outs when you just cannot concentrate. 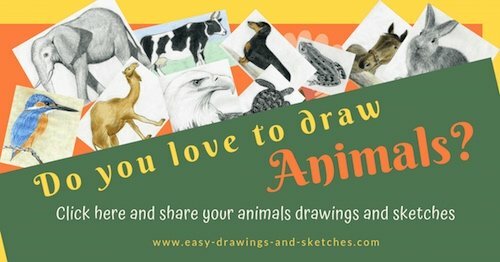 Among other body parts, outlining the legs just right is one of the core techniques when you learn how to draw a cow or learn how to draw any animal at all. Make the second line on the cow’s head as you see on the picture, and outline the horns. We are only a few pencil strokes away from completing the shape of the cow. Sketch the rest of all four legs as you see on this picture. Outline the udder and the teats approximately of the same size as you see on this picture. 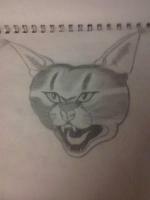 Sketch the ears, the eyes and make a weak mark of mouth and nose on the muzzle. Finally draw the tail. Please draw the tail as the last. Your cow drawing is now almost ready. 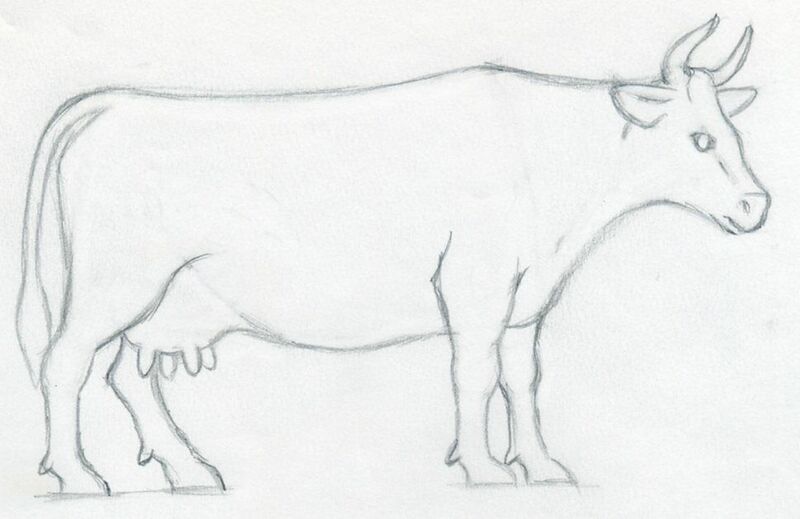 At this stage your drawing should look like a cow. If it is not, then review and RE-draw those parts where you’ve made mistakes. Just erase and draw it again. It’s about time to give it a final shape! Erase all unnecessary pencil lines. If you have a pencil type eraser, use it now. If not, use your standard eraser gently not to erase by mistake the important pencil strokes. 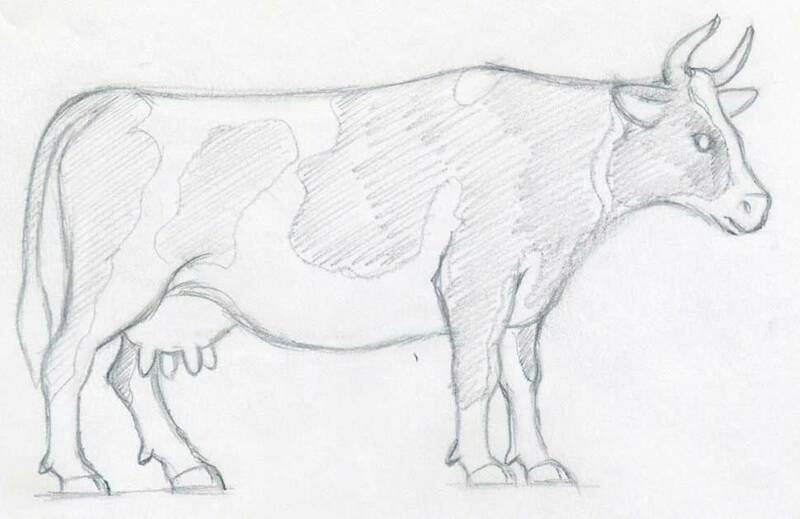 You can draw the cow’s silhouette while erasing the unnecessary pencil lines. Just use the pencil softly because you may need to erase some parts again. 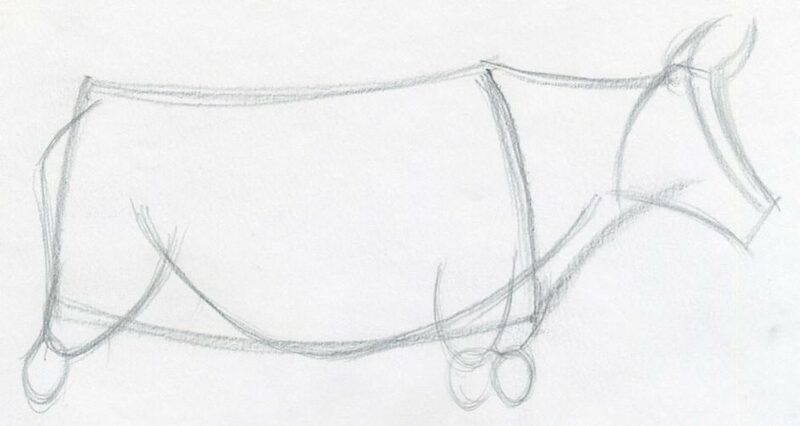 Outline the whole cow by a softer pencil line as you see on this picture. Your cow is now approximately in the same or similar shape like this one on the picture. You are virtually done. 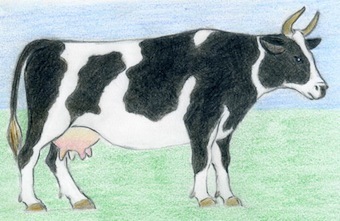 Your cow drawing is now ready. Now, you’ve learned how to draw a cow. You can stop right here if you want or you can continue to color it. Holstein cows have typical black parts on the fur. These create an interesting pattern that is unique for every cow. They look like some map. I googled a cow photo and found this pattern so I drew it. 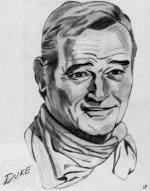 You can do the same if you like or you can google your own or you can draw your original. Use your fantasy. 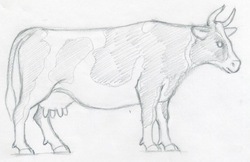 Outline the pattern on the cow’s body by weak pencil line similarly as you see on this picture. Then, fill all inner space of the pattern by short diagonal pencil strokes as you see on the picture. Please make short, weak pencil lines. It’s time to color it. Begin coloring the black pattern, but begin using dark brown color first. 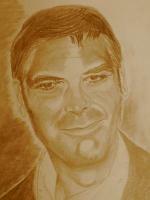 Then use black color pencil (NOT GRAPHITE PENCIL!) to cover the brown color. This will give you a unique natural blackish color. Let’s make this picture look natural. Let’s color a green pasture and blue sky. You have now colored all parts so your drawing looks like this one or better. When you finished coloring, then use the black pencil and outline again the edges of the black pattern. Also outline the entire silhouette of the cow’s body. You can play with it. Now there’s no doubt you perfectly know how to draw a cow with many details. I hope you enjoyed the process. You can upload your drawing by clicking on the banner below.